In the World of competitions and challenges for producing of new exciting applications, we are proud to be selected by such a brilliant institution like EPFL–LMTS: Microsystems for Space Technologies Lab in Switzerland. The institution is strongly involved in the cutting-edge research activities for smart microsystems, foil and elastomeric based sensors and actuators. 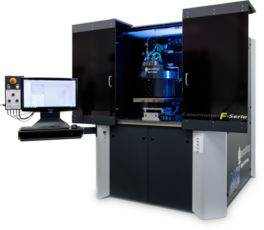 Preparing the offer for one of our CeraPrinter Model we have included the high-end configurations and options in order to supply All-in-one Advanced equipment for State-of-the-art research goals. The F-Serie printer produced for EPFL-LMTS includes Inkjet and Aerosol Jet® printing. The equipment embeds the most advanced digital printing technologies in combination with the post-processing units: UV/NIR curing & four points probe resistivity measurements. In addition to Inkjet printing, the system comes with a complete Aerosol Jet® configuration: ultrasonic and pneumatic aerosol generators with nozzles for printing fine and wide patterns. Currently, being tightly involved in the partnership between CERADROP and EPFL-LMTS, this fact makes us proud to highlight our mutual collaboration for interactions in technology improvement and bilateral promotion of our activities.